Today I didn't get a chance to draw a face, but I thought I would spend a few minutes writing about this "100 Days of Faces" project I'm doing, and what it means to me. I've been drawing since I was a little girl, but never had any formal art training. Over the years, I've taken a smattering of art courses in various guilds and Adult Ed programs, but never an intensive, truly instructional program. I wish I had some of my earlier artwork now, but I'm sure I must have destroyed it, thinking it was "not good enough". That old inner critic has hounded me my whole life! Now that I'm getting older, I realize that nothing is accomplished or improved upon without practice, and I really want to practice, make mistakes and learn. I love faces, expressions on faces, hair styles, accessories, and the stories behind those faces. 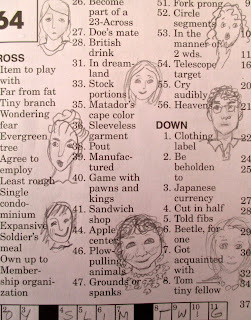 I frequently doodle faces in the margins of crossword puzzle books, notebooks I carry in my purse or in various sketchbooks. It is from these little doodles that I get inspiration for my drawings, paintings and stitched portraits. I will be honest and say that it takes courage to put my artwork out on Instagram and my blog, since I usually can find fault with every piece I do. So, thank you, dear readers, for supporting me in my efforts, reading my posts and commenting. I'm hoping to get back to stitched faces soon! Oh that inner critic! I recently read the book Your Inner Critic is a Big Jerk by Danielle Krysa (The Jealous Curator). A quick little read. Lots about artistic blocks and overcoming excuses not to create and some good advice. I always enjoy seeing your art, Judy. 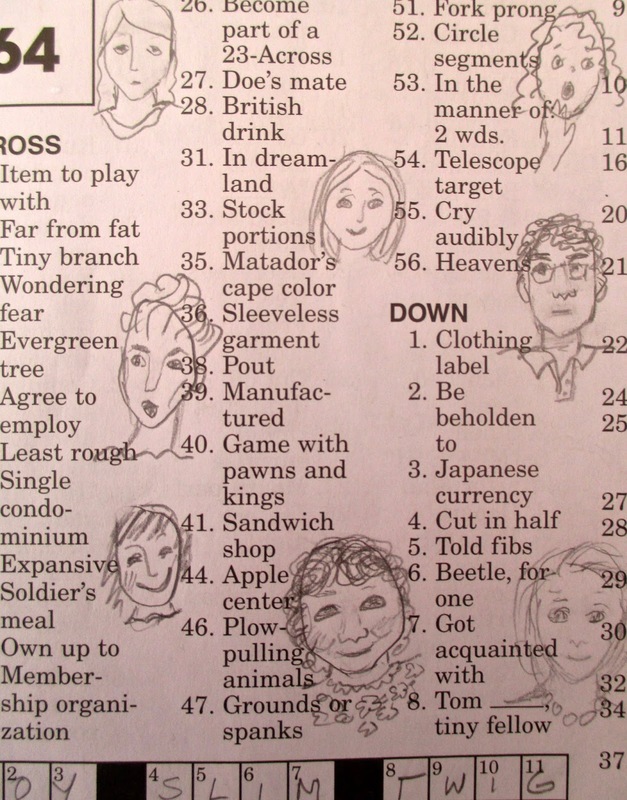 I really like this view of the faces peeking out from the crossword puzzle hints. What fun and what a good example of your creative process! I'm glad that you've embarked on the 100 Day Challenge!